Concession Profession Advertising – Reach the Buyers in the Concession Industry! The next issue of Concession Profession will come out in April 2019. Deadline to participate is March 1, 2019. 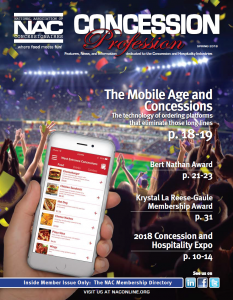 Concession Profession, the annual member magazine of the National Association of Concessionaires (NAC), is a proven resource of news, photos and features for the leaders in the recreation and leisure-time concessions industry. Why advertise is Concession Profession? -Maximize your booth investment at CinemaCon and the NAC Concession & Hospitality Expo. -Issues are distributed throughout the year at industry events, and to new and prospective NAC members. A copy of the magazine will be available at CinemaCon. -Annual issue includes NAC membership directory, a year-round reference guide for members. -Members keep the magazine for 1-2 years, and pass them along to associates. -Very reasonable rates and space options. 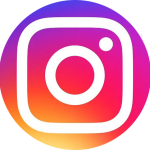 -Congratulate the 2019 Bert Nathan Award Recipient! 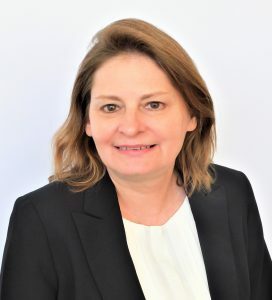 The 2019 Bert Nathan Memorial Award will be presented to Denise de Zutter of AMC Theatres on Monday, April 1 at the NAC Bert Nathan reception during CinemaCon at Caesars Palace in Las Vegas. Be among the first of your peers to display your leadership position and send best wishes to Denise by taking out a congratulatory ad in the 2019 edition of Concession Profession, the official magazine of NAC. For information on advertising in NAC’s Concession Profession magazine, contact Chris Dammann, director of communications at cdammann@naconline.org. Ads for the 2019 edition are on sale now.